FRESH 12 pack Cactus Cooler soda!!! This may be the best orange pineapple soda we have ever tasted! This Dr Pepper product is so rare you can only buy it in California, Arizona and maybe one or two other states in the deep southwestern parts of the country. But, alas we got'em for you!! Cactus Cooler was inspired by the 1960s cartoon show The Flintstones in which a fictional Cactus Cooler was the favorite drink of character Fred Flintstone. 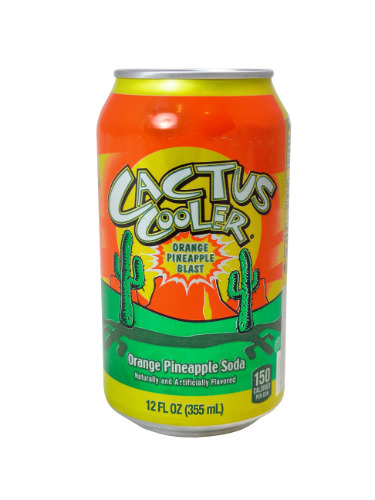 Cactus Cooler is also seen on the popular television show Weeds, where many characters favor this drink. THIS BATCH OF CACTUS COOLER WE HAVE ON HAND NOW IS NOT PACKED IN A TYPICAL 12 PACK CARDBOARD TYPE MATERIAL.